April 2, 2016. Director of GC RAS ​​Academician A. Gvishiani, Deputy Director Professor RAS A. Soloviev, principal research scientist, D.Sc. S. Agayan, leading research scientist Sh. 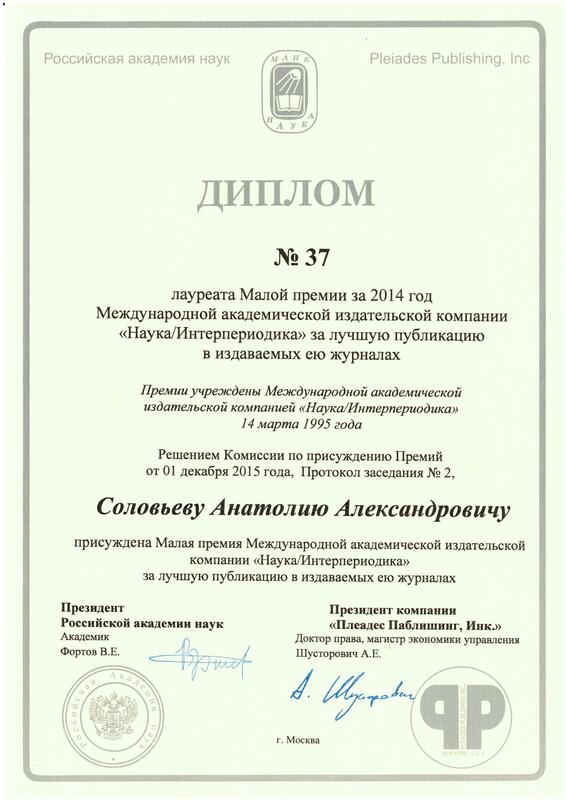 Bogoutdinov and research scientists R. Sidorov together with a group of collaborators from the Schmidt Institute of Physics of the Earth, RAS were awarded the "International Academic Publishing Company (IAPC)" Nauka/ Interperiodica prize for 2014 for the best paper on geosciences published in the IAPC journals. The prize was awarded for a series of works "Algorithmic recognition of disturbances of natural and artificial nature of the data of magnetic observatories", published in the journal "Physics of the Earth". The 2014 Prize Award ceremony was held on March 22, 2016 at the "Uzkoye" hotel.